conflicted or qualified in its identity or loyalty. The Golden Wattle Flag acknowledges the Gadigal people of the Eora nation as the Traditional Custodians of this country and its waters. We pay our respects to the Elders both past and present. The Golden Wattle Flag is designed to be a ‘new’ symbol that expresses our Australian identity. Over the last three decades, there have been many design proposals put forward for a new Australian flag. Most incorporate familiar symbols such as the Southern Cross, Commonwealth Star and kangaroo. Much like the wattle, these symbols are some of our most enduring national emblems and will always be part of our collective identity. The Golden Wattle Flag finds inspiration in these symbols, drawing them in conceptually and concretely, to build on the story of who we are as a nation and a people. The Golden Wattle Flag is a symbol of our nation’s diversity and aspirations of unity. It represents all the people of Australia, without distinction of culture, language, belief or opinion, united equally as one. “We are one, but we are many”. The wattle star emblem represents seven stylised wattle blossoms arranged around the Commonwealth Star. Two national symbols combined as one emblem. The golden wattle is one of our most enduring national symbols – it has been part of Aboriginal and Islander culture for thousands of years, it's the inspiration behind our national colours, green and gold, and is the official floral emblem of Australia. The Commonwealth Star has been the emblem of Australian Federation since 1901. It is the only symbol found on the current flag that is uniquely Australian. Most nations use their national colours on their national flag. The national colours of Australia are green and gold, derived from the palette of our national flower the wattle. As a symbol of our land and unique native flora, green and gold represent Australia more authentically than red, white and blue ever could, that’s why green and gold have been used by our national sporting teams since 1899. The shade of green used on the Golden Wattle Flag is dark myrtle, known in Australia as 'baggy green'. Australia stands apart in our diversity and uniqueness — in our culture, our peoples, our climate, our geography, our nature, our history. Our flag should celebrate and represent the rich uniqueness of Australia. The golden wattle (Acacia pycnantha) is the official floral emblem of Australia. It has served as a national symbol celebrating Australia’s nature and environment since the 1820s. The wattle represents our land and its natural beauty, our shared history, our diversity and our resilience as a people. Wattle as a symbol also holds meaning for Aboriginal and Islander peoples because it is native to this place, rather than being a memorial of our ties with Great Britain. As a symbol of nature, it represents the depth of feeling and connection to country Aboriginal and Islander peoples have with this land. Learn more Why the wattle? The Commonwealth Star symbolises the Federation of Australia, when Australia’s six colonies or states became a nation under a single constitution on 1 January 1901. The Commonwealth Star is the very symbol of Australia becoming a nation and the only symbol on the current flag that is uniquely Australian. It is found on our coat of arms, our currency, the badges of the Australian Defence Force and throughout the Australian Honours system. Detail of 'Wattle Seeds’ by Fabrianne Peterson Nampitjinpa. © the artist licensed by Aboriginal Artists Agency Ltd.
Bush Tucker near Uluru. 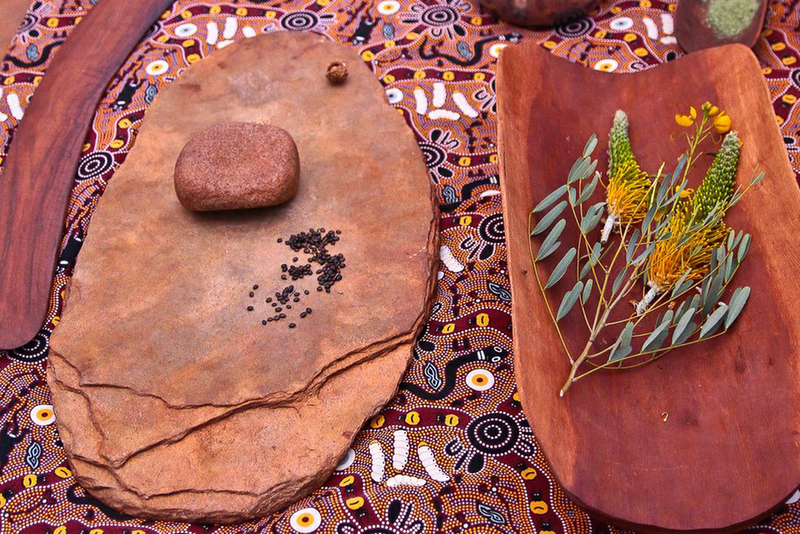 Wattle seeds, Acacia (wattle) wood Coolamon and Chocolate wattle flower. Image courtesy of Lorraine Elliott at Not Quite Nigella. 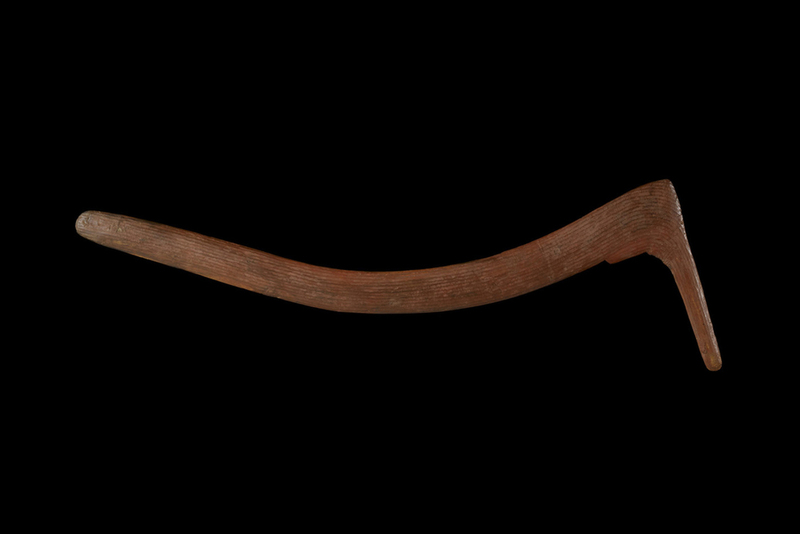 The Warumungu men of Tennant Creek and Alice Springs threw hooked boomerangs into flocks of parrots and ducks as they took off from waterholes. They fashioned them from the base of wattle trees, where the trunk meets the root, to give them strength. Image the British Museum. Flags flap. Flags drape. Flags must be seen from a distance and from their opposite side, or remain legible as a small on-screen icon. Under these circumstances, only simple designs make effective flags. 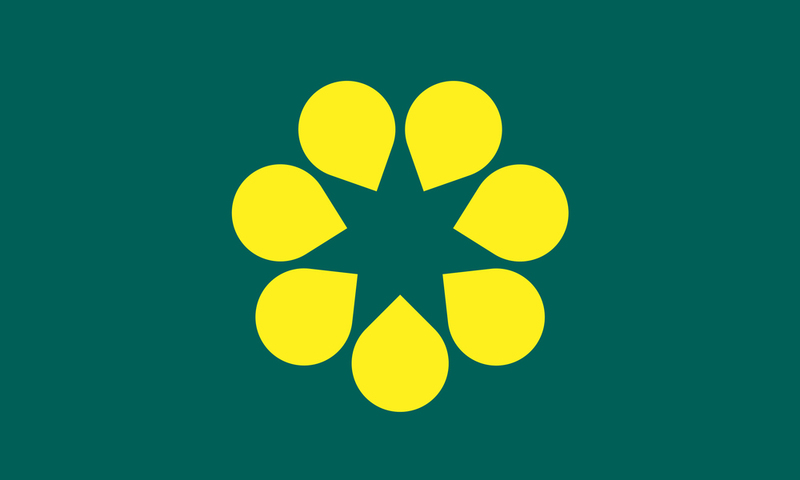 The Golden Wattle Flag has the virtue of simplicity; it focuses on a single symbol, made of bold shapes, and two strong colours. The wattle star emblem remains legible when small or when reversed, as both sides of the flag are identical. It also creates a distinct graphic when furled. A flag should be adaptable enough to work on a range of applications. A flag should be so simple that a child can draw it from memory. A flag should remain legible when small, or adapted for digital or broadcast media. The design is reversible, so front and back are identical. The preferred ratio of the Golden Wattle Flag is 3:5, although the flag can also be proportioned to a ratio 2:3 and 1:2 if required. The wattle emblem is positioned at the exact center and is 5/7ths of the height of the flag. 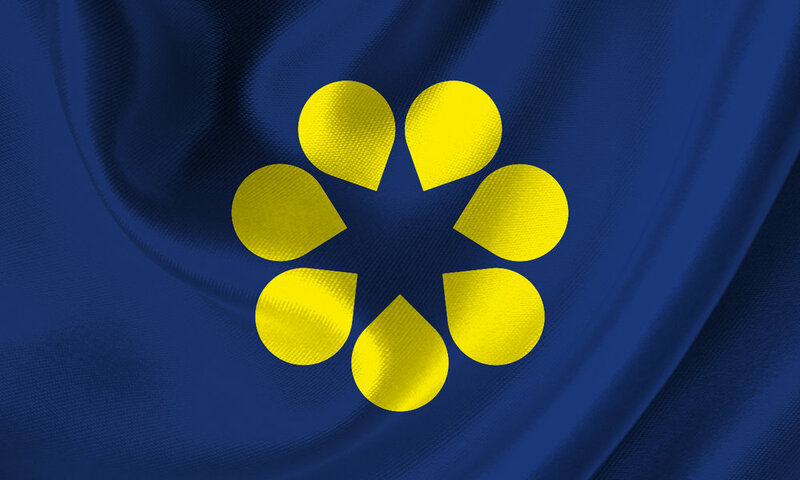 The Golden Wattle Flag also works when expressed in Australia’s traditional heraldic colours, blue and gold (yellow). Yellow represents the wattle flower. Blue represents the sea which surrounds our ‘island continent’, or a yellow wattle seen against a rich blue Australian sky. The Golden Wattle Flag is 100% Australian designed and made.